I have shelves full of cookbooks, but can always make room for more, especially when it’s one as gorgeous and delicious as the latest cookbook from Heidi Swanson, Super Natural Every Day, which Tony gave me for my birthday. 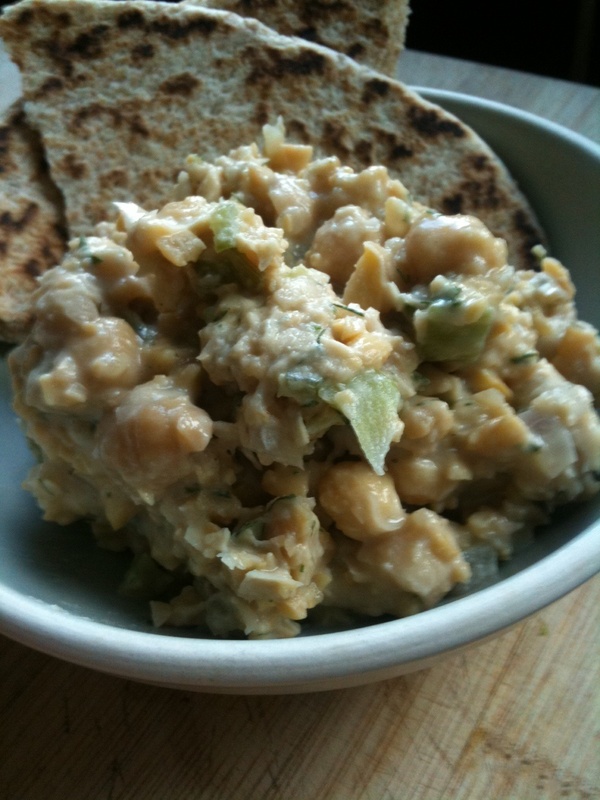 Here’s my version of my current favorite recipe from the book, which looks a bit like hummus but tastes, because of the mustard and dill, like a vegetarian tuna salad. Her recipe uses the spread as a sandwich filling, but I just eat it spread on crackers or flatbread. Pulse two-thirds of the chickpeas in a food processor until coarsely ground. (They’ll look like wet breadcrumbs.) Add them to a medium bowl with the whole chickpeas, then stir in the onion, celery, dill, and some salt. Whisk the yogurt, mustard and lemon until well combined and add enough to the chickpeas to moisten. Add more according to your taste (I like this spread rather moist, but if you’re making sandwiches you might want to keep it drier.) Serve in lavash flatbread or pita wraps with salad greens, or simply scooped from a bowl with pita triangles or chips. We’ve been feeling pretty celebratory around here since learning the terrific news that Shambhala Publications/Roost Books will publish our anthology, The Dish: Making the Meals that Make Your Family. It seems an appropriate time to give you a big cake bonanza: three recipes! all for chocolate cake! I hesitated briefly because I don’t have pictures of any of the cakes in question, they all went so fast. But you won’t need pictures if you make them yourself, will you? Chocolate Carrot Cake is dense and moist, my favorite layer cake. It improves after a day or two, so it’s great to make ahead, and you can glaze it with chocolate or (my preference) make a triple batch of cream cheese frosting and use that as filling and frosting. The cake is not too sweet and it’s perfectly chocolately. Plus, the carrots make it healthy (or so I tell myself). My friend Liz (who has contributed an essay about frosting and farmer’s markets to this collection) gave me the recipe, which originally comes from a Martha’s Vineyard cafe. It is my go-to celebration cake and is also, in fact, the one Tony baked last week to celebrate my birthday. Crazy Cake, also known as cockeyed cake or 6-minute cake, is lighter, but just as moist and chocolatey (especially if you make it with coffee, which brings out the chocolate flavor). It comes together in five minutes and happens to be vegan, which is occasionally useful. Kids like to stir it together because the vinegar and baking soda make a satisfying chemistry lab reaction, so we make this batter into cupcakes for all the kids’ birthday parties. And finally, Smitten Kitchen’s Everyday Chocolate Cake is this summer’s happy new cake discovery. It is a perfect one-bowl, dark and satisfying chocolate cake. Making it in a loaf pan gives it a simple and sturdy everyday look, though I suppose there’s nothing stopping you from doubling the recipe, putting it in round cake pans, and frosting it. But try it as written, because who doesn’t need chocolate cake every day? If you have these recipes in your repertoire, you will need no others. After making the honey ice cream the other day, I had 6 egg whites left over. I could have made an egg white omelette, I suppose, but that’s not really my style. Grease an 11″x17″ jelly-roll pan and line the bottom with parchment paper. When all the sugar has been added, the foam will be creamy white and hold soft, moist, glossy peaks that bend over at the points; do not beat until stiff. Sift a fine layer of the flour mixture evenly over the surface of the egg mixture and fold gently with a rubber spatula only until the flour is almost incorporated. Do not stir or mix. Repeat 7 or 8 more times, until the flour mixture is all incorporated. Pour the batter into the prepared pan and spread evenly. Bake until the top springs back when lightly pressed, about 15 minutes. Let the cake cool completely in the pan. Invert the cooled cake onto a sheet of wax paper and remove the baking pan and peel off the parchment paper. Now lift the wax paper and turn the cake right side up on to a sheet of aluminum foil. Peel off the wax paper (a thin top layer of cake may come off; that’s fine). Now make the filling; I used lightly-sweetened whipped cream, beat stiffer than usual: 1 cup of heavy whipping cream, 1 teaspoon vanilla and 1 tablespoon confectioner’s sugar, beaten until stiff. Spread over the cooled cake and then roll up the cake starting at one end: fold and press an inch or so of the cake firmly up over the filling at one end to get started. 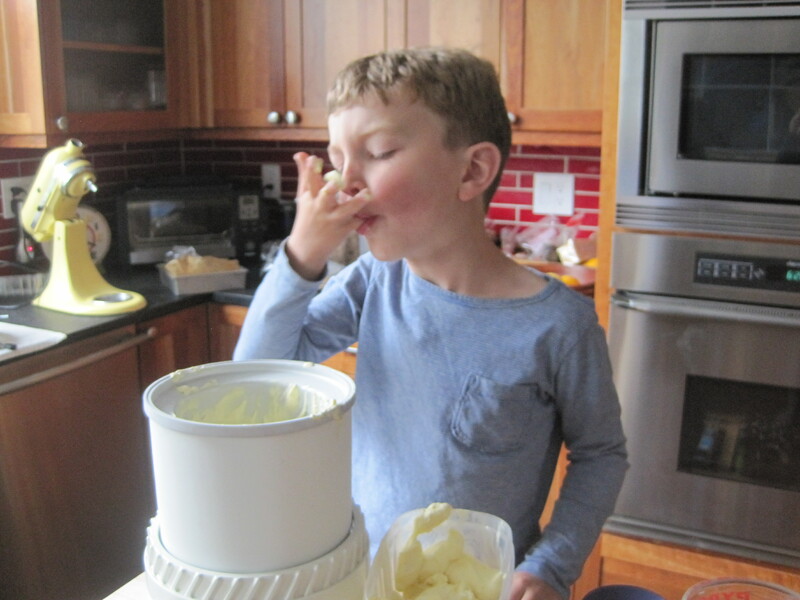 Even if the cake cracks at first, keep your first turns especially tight; the cracking will diminish as the roll gets bigger (also, you can cover cracks later with whipped cream, frosting or a sprinkle of confectioner’s sugar; also, no one will care what the cake looks like). Once the cake is rolled, wrap tightly with foil and refrigerate to firm the cake before serving. 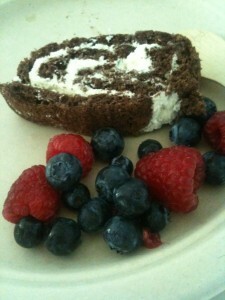 Serve with honey ice cream, extra whipped cream, and/or berries. I am learning — slowly — that while San Francisco doesn’t offer the summer weather I grew up with (and long for) when school lets out each year, there are ways to compensate for that. Here at home it may be 60 degrees, with fog swirling in the street and a wind so strong it picks up our deck umbrella and tosses it into the neighbor’s yard (we only open the umbrella a couple days in the spring and then again not until our real summer in October, so I hardly know why we bother.) But we can drive half an hour north to the swimming pool or half an hour south for a sunny oceanside hike and that gets me in the mood to make summer in the kitchen, too. So when school let out last week and we faced another foggy day, I summoned my sunniest mood and said to the boys, “It’s summertime! What kind of ice cream should we make?” Ben was first to answer: “Honey ice cream!” And Eli was the one to help. Happy summer. The recipe is from my go-to ice cream book (everyone should have one): Bruce Weinstein’s The Ultimate Ice Cream Book. Bring the milk to a simmer in a heavy saucepan. Slowly beat the hot milk into the egg and honey mixture. Pour the entire mixture back into the pan and heat slowly, stirring constantly, until the custard thickens slightly and coats the back of the spoon. Be careful not to let the mixture boil or the eggs will scramble. Take off the heat and pour through a strainer into a large bowl. Cool slightly, then stir in the cream and vanilla. Cover and refrigerate until cold, or overnight. Stir the chilled custard, then freeze in your ice cream machine according to its directions. *Tune in next time for a way to use those 6 egg whites.